From time immemorial flowers were used to control the offensive and obnoxiousness of body decomposition. No doubt this was part of the reason that flowers were used in the Shanidar Cave burials so many centuries ago. One of the most famous funerals where flowers were used to mask the odor of decomposition occurred in 1874 when President Andrew Johnson was buried. his body was not embalmed, and by the day of his funeral his body was in such foul condition that undertaker Lazarus C. Shepard closed the casket and heaped loads of fragrant flowers on top and around the burial receptacle. The fragrance of the flowers hid the odor long enough for the funeral to take place. 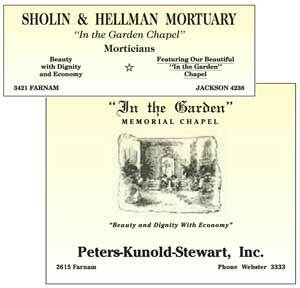 In 1914 C. Austin Miles wrote the famous funeral hymn "In the Garden.". "I come to the garden alone, while the dew is still on the roses." And he tells me I am his own...."
The hymn stormed the country and became one of the most frequently sung hymns at funerals in the United States. The hymn also began a movement in funeral services whereby the mortuary practices of the country would revolve around the body reposing in the garden. In fact the movement in Protestant funeral practices in the United States to use the "In the Garden" theme was so strong that funeral homes began to develop facilities which used an indoor garden as the back drop where the body would repose. Flowers are a visual expression of love, sympathy, and respect. They are means of lending support and sharing the burden of grief. These chapels were actually solariums with water falls, plants and flowers, and even live birds flying around inside. And, as is seen in funeral home ads (right) of the 40's and 50's, the establishments actually utilized the "In the Garden" name. The importance of flowers in funeral service was probably best exemplified by the creation in Mid Western funeral practices of the role of the Flower Lady. The flower lady was analogous to the pall bearer role, but instead of carrying the casket this group of women (usually six) would carry the flowers from the place of the funeral to the flower vehicle, and then would assist in setting them up at the cemetery. Flower ladies were chosen with as great of care as the pall bearers were, for they were usually close friends of the family and it was viewed as a distinct honor to be chosen. The flower lady role eventually subsided as the funeral ritual became less community oriented and people's life styles became more hectic. Your own belief in the value and benefit of funeral flowers will be your greatest asset in presenting this information to families. There is a common denominator in sending flowers, in giving to charity, and in supporting one's church. It is sentiment. Sentiment is actually a complex organization of ideas, feelings, and instincts which are built up in the course of an individual's experience. Sentiment serves a very vital human need. It should be realized, too, that mankind's need for sentiment is the basis for the development of many of our funeral traditions. There is a great deal of insight in the remark made by the famous English statesman, Gladstone. He said, "Show me the manner in which a nation or community cares for its dead and I will measure with mathematical exactness the tender sympathies of its people, their respect for the law of the land, and their loyalty to high ideals." Flowers create a background of warmth and beauty which adds to the dignity and consolation of the funeral service. Those who have attended services where there were no flowers have expressed the feelings that something was missing... that the funeral was depressing. Families deserve the right of complete freedom of expression at time of death. People are not cast from the same spiritual or emotional mold. Therefore, they should be free to express themselves in the manner which best conveys their emotions. Any expression which is the result of dictate, ceases to be an act of the heart. Americans traditionally have expressed their respect for the dead, and sympathy for the bereaved by sending flowers. This long-standing custom helps people express their innermost feelings. Funeral flowers are for the living and the dead. They are tokens of respect for the deceased. The more comforting the memory picture, the more easily it is recalled by the bereaved; and the more vivid is the reinforcement of reality and actualization of loss. Flowers do not wither and die in the mind of the bereaved. They are recalled time and again as indelible memories. They are symbolic not only of the love and sympathy, but also of eternity and immortality. Flowers help minister to the bereaved by giving testimony of the love and understanding of follow human beings. The life of flowers is fleeting. They attest to the transitory life of man. There is profound religious symbolism in the very fact that flowers do not last forever. Flowers do not wither and die in the mind of the bereaved. They are recalled time and again as indelible memories. "Please Omit Flowers" and "in lieu of flowers" notices occur from time to time in various publications. These requests generally originate with the family, who have been influenced by well-meaning friends or organizations. There are many implications in such a request. The obituary is actually an announcement of the death and an invitation to friends to attend the funeral. It is not considered good taste to openly anticipate a gift and accompany an invitation with a dictatorial statement that only certain kinds of remembrances are acceptable. A "PO" or "in lieu of" request causes embarressment to friends. Some ignore the request and send flowers, causing embarrassment to those who heeded the request. Many people resent being told how to express their sympathy. They like to decide for themselves whether to send flowers, make a donation, send a card, or extend a helping hand. There is a place for both flowers and charity in our modern day world, and it is important that we place each in its proper perspective. The funeral meets the bereaved's need for support. Death throws people into despair and depression by separating them from one who has provided love, companionship, and security. The funeral and our funeral customs provide the means by which those close to him can give their support and share their suffering. The funeral period provides for the expression of sorrow. Only through talking out the past can the bereaved person realize the extent of the relationship with the deceased and accept the loss and suffering. Only through weeping and talking to good listeners can they release their grief and their feelings of guilt and hostility. Experts in grief therapy believe that grief can be expressed best through rites, rituals and ceremonies. The ceremony deals primarily with intellectual concepts and doesn't fully engage the bereaved's feelings in the patterns of community support which are psychologically beneficial. Flowers though express the inexpressible - they are symbolic. People have traditionally expressed their respect for the dead and sympathy for the bereaved by sending flowers. This custom is one of longstanding and it has served people as a means through which they can express their feelings. There are three points to be stressed finally in connection which the tradition of funeral flowers. First, the role of flowers are both symbolic and aesthetic. They add great value to the richness and meaning of the ritual. Second, flowers represent sympathy extended to the bereaved. Third, flowers are sent both to the living and the dead. Flowers are sent to the living as comfort and they are sent as tokens of respect for the deceased. Todd Van Beck - Associated with A.S. Turner and Sons in Decatur, Georgia, Todd is probably one of the most highly regarded speakers in our field today. He can be reached through his website www.vanbeckseminars.com.